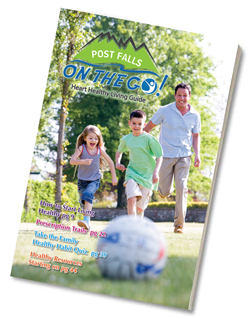 Take a look at your family’s healthy habits with quick quiz | Post Falls On The Go! Take this Healthy Habits quiz to help you identify areas in your life where you can make changes to improve your health and the health of your family. Have regularly scheduled mealtimes at home? Eat meals together at least once a day? Adjust portion sizes to each member’s needs? Eat three meals and 2-3 healthy snacks daily? Avoid eating everything on your plate? Eat only in designated areas of the house? Eat with the TV off? Try one new fruit or vegetable every week? Enjoy physical activities together weekly? 22-20 – Your family is on the right track. Keep up the good work with healthy eating and physical activity. 19-13 – Your family is doing well, but could work on areas where you answered “no/sometimes.” Start today! 12 or lower – Evaluate your “no/sometimes” questions and improve on these areas to increase your healthy eating and physical activity.